A parade photo.. Lots of People JAYA! The Lord of the Universe with His consort and brother situated on Their chariot. A nice crowd shot of the many that made the sojourn to the festival. An older generation takes a refreshing look at life as they read the Vegetarianism exhibit. Some festival goers enjoy an ecstatic day of bliss, including Festival of India veteran, Bhakta Ben. A long shot of the Festival as it unfolds. Festival of India 2007- What's Going On? With two festivals notched on our belt, (University of Florida in Gainesville and Tampa Bay), we're coming closer and closer to the full-fledged 2007 Festival of India tour. What that means is currently, we're endeavoring our very best to make sure that everything this year is in tip top shape. Panels are being restored and new one's designed, ideas are being channeled to sort out what is feasible and practical, and thus far our best tangible addition has been the brightly colored brand new tent tops for our tents. As I type, several devotees are pulling their efforts to bring our older fiberglass panels into shape headed by FOI Headquarters' very own Bala. I'm not sure how many of our readers have dealt much with fiberglass, but I can tell you, we live with respirator masks on for most of the day, our bodies itch far into the sleeping hours, and sometimes the heat waves of the upcoming spring and summer months hit all helping bodies with a dampening ability of service.. 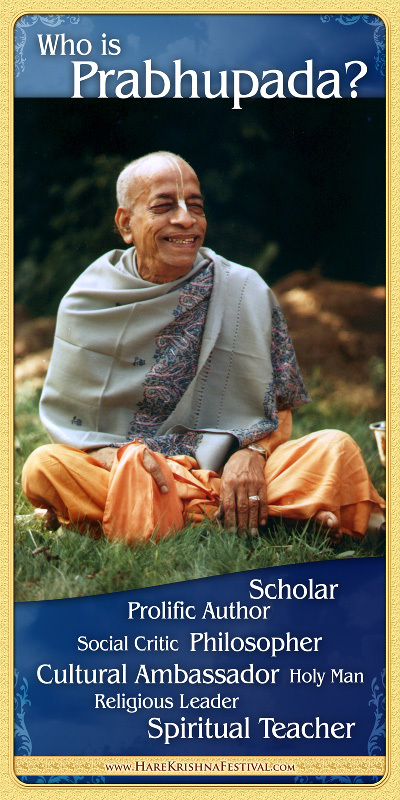 However, all of this anxieties are far surpassed by the fact of knowing that each of the panels is just like a chapter of one of Srila Prabhupada's books, ready to benefit anyone who as much as glances on it. Even though there's some hardship, everyone is in good spirits helping to shape Festival of India in the year to come. Along side this effort, Phani Bhusan and Rasikananda are the driving forces behind a new "Who Is Prabhupada" exhibit that will hopefully be unveiled by our first festival in May. I've been helping with what I know how to do in that realm, but Rasikananda is both enthusiastic and expert at the design where Phani Bhusan has perfectly chosen the text. Having worked previously as a designer, the match is Krishna's perfect arrangement. Within a fortnight all materials should be available for the design process to be applied to the 3 dimensional aspect. With just a tinge of mercy, all will proceed fluidly leading, hopefully, to development of newer, better, and more effective panels in our preaching efforts. As anyone can see, this one area, separated into two aspects is our main endeavor right now. Read more about Festival of India 2007- What's Going On? Festival of India Tour in Brazil finished on Jan 28th with great success. Around 30 devotees have traveled together over than 700 miles thourgh beautiful brazilian coasts taking diferent aspects of India. We got many facilities by the Cities Hall and specially the Consulate of India in Sao Paulo which became an important partner. Now, we`ve just started FOI 2008 organization and we have been inviting youth from America to join us next January 2008!!! the pictures attached are related to FOI Sao Paulo, the biggest of Latin America so far!!! Festival Of India--all Bright New Tents for the 2007 Tour! After the devestating Storm in Washington DC on July Fourth of this year, all the tent tops needed to be replaced. Just last week we placed the order for all new multi-colored striped tent tops. You can look forward to seeing a bright new looking Festival Of India this coming --2007-- Festival Season! Hare Krishna! Read more about Festival Of India--all Bright New Tents for the 2007 Tour!